Neil Dittman ’19 — I would like to extended a deep gratitude for the opportunities afforded by the Givens family. With their generosity, I was able to engage with art from all around the German-speaking world. My primary focus of study was the Blaue Reiter and the BrückeGerman expressionist movements. My first excursion was to Munich, the birthplace of theBlaue Reiter Expressionist movement. 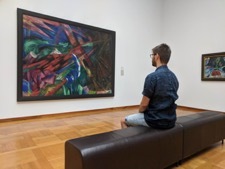 There, I went to the Lehnbach Haus and Pinakothek der Moderne because of their impressive collections featuring works from Franz Marc, August Macke, Paul Klee, Gabrielle Münter, and Wassily Kandinsky. From Munich, I was able to swing down to Kochel am See so see the Franz Marc Museum. Franz Marc was a particularly interesting artist to study because of his color theory. He assigned colors various symbolic affects, imbuing his works with an extra layer of subtext. He liked to paint animals and a lot of his work focuses on the nature of animals. One work that I was able to see in Basel, Switzerland was his movement-defining masterpiece “Tierschicksale”. This was the absolute highlight of my experience studying art abroad. “Tierschicksale” (The Fate of the Animals) depicts the apocalypse from the perspective of the animals. The massive piece was partially destroyed in a fire and later restored by Paul Klee. It was absolutely stunning to see in person, and I cannot thank the Givens family enough for allowing me the opportunity. My next stop was the Brücke Museum, Nationalmuseum, and Neue Nationalgalerie in Berlin. These museums house the best collections of Brücke art. The Brücke was a German Expressionist movement that thought of themselves as a bridge between the present and future of art. There, I was able to see works from the movement’s founders, including Ernst Kirchner, Karl Schmidt-Rotluff, Fritz Bleyl, and Erich Heckel. 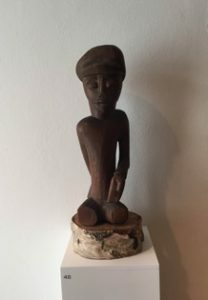 What I found particularly interesting was the movement’s fascination with art from Africa, which at the time was considered “primitive”. Cultural exoticism, however racist or reductivist it may be, can still fascinating to observe because it reveals a lot about the social climate from which it was conceived. One of the most interesting aspects of this particular study was seeing art that marked the shift from representational art to abstract art. For me, this shift serves as a reminder that many ideas that are taken as a given in our world were once ideas on the cutting edge. This was an idea that was reinforced in my history of installation art course I completed in Germany. The members of of the Blaue Reiter and Brücke movements pushed the boundaries of art and what could be considered art, much like Minimalism, Prefab, and Earth Art movements that would emerge in the late 20th century. My experiences I have amassed with the help of the Givens family has helped me construct a more cohesive narrative in art history. I no longer view pieces of art as individual, isolated incidents, but rather points on a line, or chapters in a book that will never be finished.